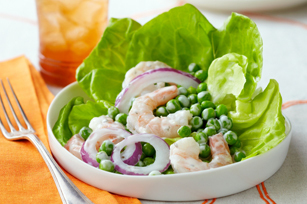 Turn everyday ingredients into something special with our Shrimp and Pea Salad Recipe. Even better, our Shrimp and Pea Salad Recipe is ready in 10 minutes! Place shrimp and peas in colander; rinse under cool water until thawed. Drain well. Place in large bowl. Add onions and dressing; mix lightly. Arrange lettuce on 4 plates to resemble cups; fill with shrimp mixture. No peas on hand? Use frozen corn to prepare this easy-to-make salad instead. Shrimp is readily available, already peeled and cleaned, in your grocery store's freezer case. Just thaw in the refrigerator overnight or rinse under cool water in a colander until thawed.